Behemoth is a demigod under Chaozalem, ruler of the 1st layer of Hell. After being summoned by a member of the Shadow Council (who had been imprisoned at the Technocrat headquarter), Behemoth was trapped and used by the Technocrats in their experiments with trying to breed demons with humans. The only two successfull offspring produced were the brothers Melchar and Borghard. Borghard later died and Melchar’s soul was destroyed by the evil Anthrax Picard, who used it to obtain Demilich status. Behemoth was freed from imprisonment when Melchar, Anthrax and their companions stormed the Tecnhocrat HQ in an attempt to save Melchar’s mother. The mother, however, was too ruined after her experiences, so Melchar decided to give her the rest she so desperately needed – and killed her. 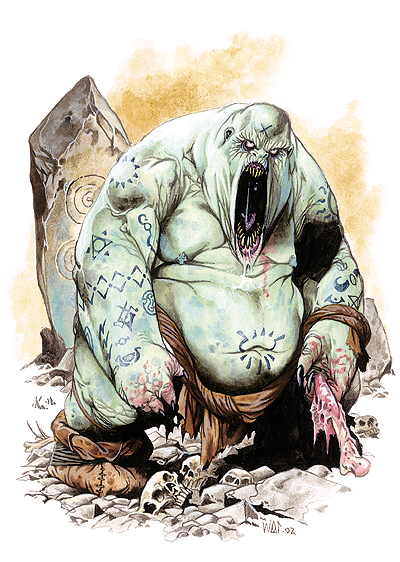 Behemoth, thankful for his release, offered great gifts to the adventurers, and some of them accepted his offerings. Anthrax even sold his soul in return for mighty powers. Some time later, the adventurers learned that Behemoth had started summoning a demon army in order to relesae his master, Chaozalem from Cloudhaven, a flying prison where the necromancer Sauron was being held. Sauron had previously tricked Chaozalem into manifesting inside his own body, and managed to trap him there. The adventurers gathered aid from the mightiest people they knew around the world and assaulted Behemoth and his minions, slaying Behemoeth almost instantly, since he was still rather weak. But Behemoth had made some precautions, and instead of being sent back to Hell, his spirit stayed in his throne, waiting to manifest itself into whomever was foolish enough to sit on it. Haru, the golden emperor, decided to take the throne from safekeeping, but it disappeared and later reappeared in the tower of Anthrax Picard – where Anthrax decided to release the demon. Another of those who had helped deal with Behemoth, Balthazar Ilvatu, later orchestrated the invasion and subsequent release of Sauron/Chaozalem. The flying prison Cloudhaven was then seized and is now run by a former prisoner, Angerbast, while the previous warden, Dervious (an ancient blue dragon) barely escaped. After Chaozalem was freed, Behemoth joined him and is helping him build another demon army, this time in order to wage war upon the whole planet. What Behemoth doesn’t know, however, is that it isn’t Chaozalem which is in control of the entity, but rather Sauron….. Create Spawn (Su): Slain opponents rise as Famine Spirits after 1d3 days unless a protection from evil spell is cast upon the corpse in time. Draconic dinosaurs are dinosaurs with dragonlike features, not dragons resembling dinosaurs. Therefore, they are neither dragons nor dragon-kin. They do not have names, class levels, feats, NWPS etc. But they are highly intelligent and able to communicate if they should choose to. However, they have not evolved naturally, so there was only ten of them on the wild world to begin with. And after a group of adventurers stumbled upon some of them, the number of draconic dinosaurs still alive has been dwindling down into near extinction. Breath Weapon [Ex]: 200m long, 100m wide, 100m high acidic cloud of stomach acids. (24d4+24)X10 acid damage the first round, half damage the second round and a quarter damage the third round. . Breath Weapon [Ex] 1.000 feet long, 50 feet wide bolt of lightning (24d8+24)10 lightning damage. Special: The Blue Draconic Dinosaur attracts electricity, and is constantly sparking and igniting. Anyone who comes within 30 feet of it will automatically be hit by electricity charges [Ex] for 1d8X10 pr. round. Striking the dinosaur, releases lightning [Ex], and the attacker takes 3d10X8 lightning damage. Stone Form [Ex]: When fearing for its life, the dinosaur can assume the form of a colossal rock as a Free Action. While in this form, its fast healing and regeneration abilities are dormant, but the rock itself is immune to magic and has DR 500/All. Fear [Ex]: The Green Draconic Dinosaur can instill compelte fear in one target every round. The target is unable to act, but can defend. This is an effect which works on anyone immune to fear, aside from Demigods, undeads, mindless constructs and those with higher HD than the dinosaur. Zone of Truth [Su]: The dinosaur is surrounded by a 300 feet radius zone which prevents anyone other than himself from lying. Breath Weapon [Ex]: A cone of molten gold 900 feet long, 50 feet wide at mouth, 300 feet wide at end, dealing (24d12+24)X10 fire damage. Anyone who fails their save vs Breath Weapon is also immediately encased in gold and dies of suffocation within 1/3 CON rounds. Those who save successfully is Slowed [Ex] by the gold patches on their body. Luck [Ex]: Reroll any one die daily and choose best result, in addition to +10 on all ability saves. Breath Weapon [Su]: Cone of Fire, 50 feet wide at mouth, 300 feet wide at end, 900 feet long. (24d10+24)X10 fire damage. Breath Weapon [Su]: Cloud of complete blackness, 400 feet long, 300 feet wide and 200 feet high, dealing (6d4+4)X10 negative energy damage and blinding anyone within for 10 rounds and draining half their base levels permanently. A successful save drains 1/4 base levels for 24 hours. If brought to lvl 0, you die and rise as a Wraith immediately. Shaded [Su]: The dinosaur is surrounded by an ever present aura of night, which has a radius of 5 kilometres. The aura can follow the dinosaur or be placed at a certain spot, making it impossible for anyone to predict where inside the aura the dinosaur is currently located. Inside the aura, everything is as dark as a clouded night. Outside the aura, looking in, everything seems normal. The dinosaur is aware of any presence within this aura. Reflective scales: The silvery scales makes it hard for opponents to aim due to how they reflect the light, resulting in a -24 hit penalty. Breath Weapon [Ex]: Cube of toxic gas, 700 feet in all sides. Save vs Poison DC 40 or die instantly. If you succeed, you take 7d4X10 damage. Breath Weapon [Su]: Cone of frost, 700 feet long, 50 feet wide at mouth, 250 feet wide at end. (12d6+24)X10 cold damage. Icy scales [Ex]: The dinosaur is so freezing cold within that a layer of ice always coveres its entire body. This layer repels all spells, with the exception of fire based spells (which work normally, assuming they penetrate the MR). Aura of Winter [Ex]: The temperature around the dinosaur drops so much that all within a 300 feet radius take 3d10 cold damage every round (double damage for flying creatures) and the ground is immediately covered in ice for 24 hours. There are only seven known blood dragons in the world. Zarovich, the Keeper of Blood (also known as Raugh) is the father of all blood dragons. His offspring, Vlaziska, has hatched four eggs and one of her children, Lestat, joined The Order of the Dracul along with his Dragon Rider, Ariel. In addition to these six dragons, a former gladiator named Enormious was turned into a blood dragon by Zarovich after he had helped release him from imprisonment in Hell. Enormious promptly changed his name to Blood and stayed on the Hellship Demonwing as payment for carrying the party to the depths of Hell and back. A Blood Dragon is treated neither as a regular dragon (which is considered as a monster with no NWPs, WPs, Feats or class levels) or a special dragon (which has both NWPs, WPs, Feats and Class levels). Instead, it stands somewhere in the middle. It does not have WPs, NWPs or other class levels than the ones it needs to gain dragon immortality, but it starts gaining Feats at lvl 1 and get its first Epic Feat as lvl 1 Dragon Ascendant. Once it reaches lvl 24 (34 HD), it continues advancing as an Epic Dragon. Combat: A blood dragon’s blood is hot and acidic and will burn away flesh, items, wood, stone, metal etc. Each time you inflict physical damage on a blood dragon, there will be blood splatter. Normal weapons are destroyed automatically. Magical weapons are not affected. The blood deals same dmg as dmg taken. You need invulnerability to both fire/acid to be immune and damage reduction to both fire/acid to have dmg reduced. The Blood Dragons gain levels as normal characters up to level 24 (xp progression as fighter). The first 12 levels are Blood Scaled Fury levels, and the last 12 are Dragon Ascendant levels. 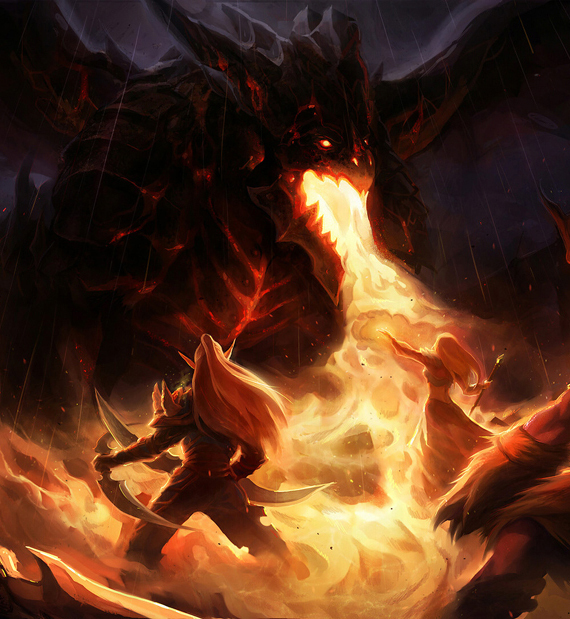 At level 12 Blood Scaled Fury, the dragon needs a hoard of at least 500k gp value, and the entire hoard must be consumed in order to start the process of becoming a dragon ascendant (ie. start as lvl 1 dragon ascendant). 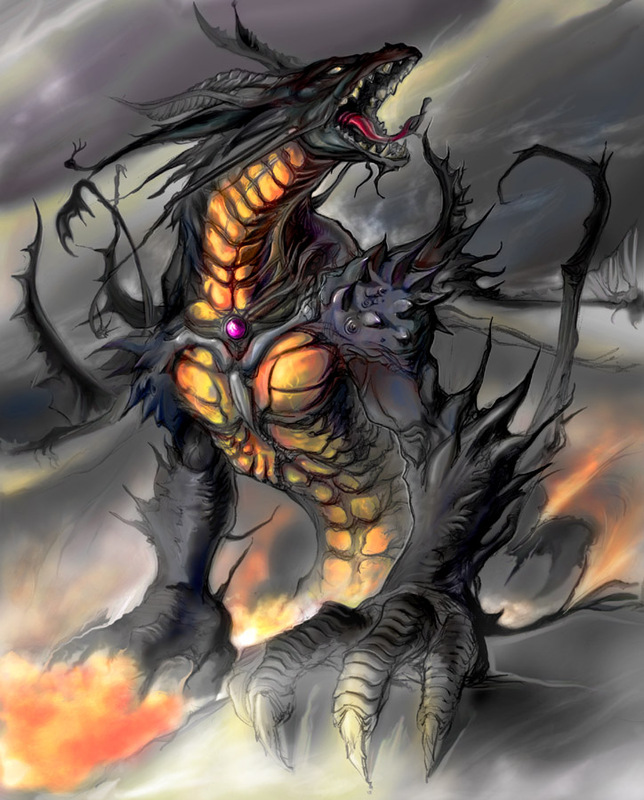 And the dragon must reach lvl 12 dragon ascendant before his lifespan ends in order to gain dragon immortality. This means that a Blood Dragon has to become a lvl 12 Dragon Ascendant in order to live beyond 100 years and grow Venerable and beyond. A blood dragon’s breath weapon is a dark reddish cloud of hot, acidic gas which is 50′ long, 40′ wide and 30′ high. Creatures within the cloud may save vs breath weapon for half damage, and it deals both fire and acid damage. A blood dragon casts its spells as a lvl 13 magic user, adjusted by its combat modifier. Hatchling: Heat blood at will (free action). 1 target. save vs spell to resist, spell resistance applies, immunity/resistance to fire applies. Round 1: You feel extremely warm. Very Young: Flesh Runes. Carve magical runes into your scales. 1 rune pr. age category. Each rune adds either +1 hit, +1 dmg, +1 saves, + 1% MR, +1 DR/All, +1 AC, +1 SR/All (spelldmg reduction) or + 10 hp. Runes are permanent and cannot be replaced. Young: Blood Sacrifice. Cast extra spells, but it cost 5 hp pr. spell lvl. Juvenile: Turn Blood. Acts as Turn Undead, but only affects living creatures with blood running through their veins. As priest of same blood scaled fury (+ dragon ascendant) lvl. Young Adult: Slow Blood. Free Action. Acts as the Slow spell, as a result of the blood running extremely slowly through the victims’ veins.. Only affects living beings, but in addition, they need to succeed DC 20 CON checks every round or fall unconcious due to the lack of blood to the brain. Making no actions at all allows you to skip this CON check. Adult: Crystallic Blood. The Blood Dragon can choose to forfeit the acidic/fiery blood splatter when he is hit in return for his own blood turning crystallic, making him take half damage from all physical damage. Turning this ability on and off is a Free Action. Mature Adult: Watery Blood. Only works against living beings. Save vs PP to avoid the effect. Magic resistance applies. Single target. 1r/lvl. Free Action: The victim’s blood becomes watery and he will take double damage from all physical damage for the duration of the spell. Old: Fiery Blood. No save, magic resistance applies. Single target. Only works on a living tarket. Free Action: Cause the blood of your victim to ignite and explode in a red fiery ball, dealing 10d6 Fire damage in a 20 feet radius. Those in the vincinity must make a save vs BW for half damage. If the victim is still alive after the explosion, he is covered in horrible wounds and has suffered such a blood loss that he is stunned for 1d4 rounds. Very Old: Blood to Sand. Only works on living targets. Save vs PP to avoid. Magic resistance applies. Free action: Your blood turns to sand for 1r/lvl rounds. Save vs CON DC 24 every round or die instantly. However, you are immune to physical damage for the duration of the spell. Venerable: Vaporize Blood. Only works on living targets. Save vs spell to avoid, magic resistance applies. Free Action: The blood of the victim is disintegrated and he dies instantly. Only a Wish spell is able to restore the victim back to life. Wyrm: The Blood Dragon’s Breath Weapon becomes a Free Action. Great Wyrm: The save DC of all your abilities/spells increase by 12 and becomes a CON based ability check (which means that saving vs a regular spell becomes a DC 32 CON check instead of a DC 20 save vs spell).